Eight thousand six hundred kilometers lie between Tacoma, WA, in the United States and its sister city Fuzhou, Fujian Province, in southeast China. A seating row lies between David Morse, 57, a history and English teacher at Tacoma's Lincoln High School, and Xi Jinping, President of China. Xi and his wife Peng Liyuan paid a visit to Lincoln High School during his first state visit to the United States as president on the afternoon of September 23. Xi had visited the school when he worked in Fujian Province 22 years ago. Addressing an audience of several hundred at the school's auditorium, Xi said education has a bearing on the future of a country and a nation, expressing his hope that students of the two countries would work together to build a better future for Sino-U.S. relations. The first couple also watched a song concert presented by students in both Chinese and English--On the Field of Hope in Chinese and What a Wonderful World in English. "I was sitting in the row behind the president and his wife. Both were smiling broadly. They seem like very friendly and approachable people," Morse recalled. "Our school is named after Abraham Lincoln, our 16th president, and something in President Xi's speech made me think of a connection between these two great men. President Xi was talking about the importance of education, and he talked about how he would voraciously read books when he was herding animals in the hills during the 'cultural revolution' (1966-76) because he could not study at a school. This made me think of President Lincoln who was born into a very poor family in a frontier region of America where books of any kind were very scarce. He read books by the light of the fire in his cabin," Morse said. Chen Chunya, a music teacher from the Affiliated High School of Fuzhou Institute of Education, was sitting in the third row behind the president. He oversaw the Chinese chorus. About two months ago, Chen was designated program planner for cultural exchanges with Lincoln High School, their sister school since 2008. "We were informed on September 17, one day prior to our departure, that the first couple would be our audience," Chen told Beijing Review . "That was exciting." 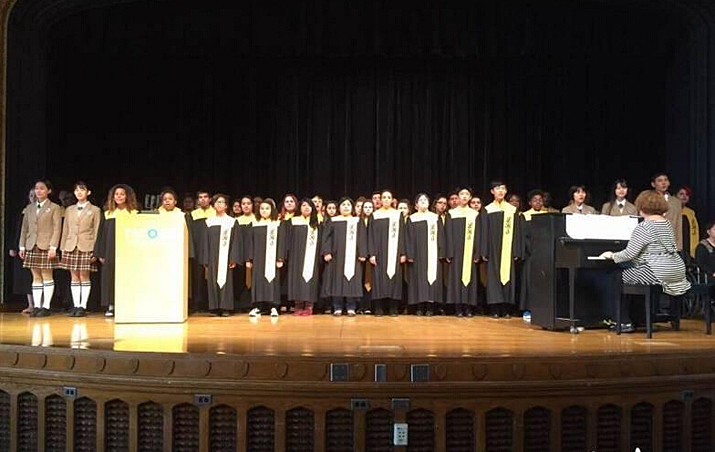 Chen, together with his five choir students, worked closely with their American counterparts. "I scheduled rehearsals for On the Field of Hope overnight. We were pressed for time, but we were well-trained and, more importantly, passionate," Chen noted. "I was deeply impressed by the students' authentic pronunciation of Chinese during rehearsals." "The most significant thing for me was listening to the song that came from their hearts," Chen said. "It painted us educators a rosy picture--students of both nationalities could communicate and learn about each other through music." Xi presented gifts to the students, including books on China and a ping-pong set. For Morse, the most precious gift was the president's personal invitation for 100 Lincoln students to visit China next year. Previously, Morse had tried to organize a trip for nine Lincoln students two years ago but was not successful for a number of reasons. "I was incredibly excited when I heard the president's announcement. It was absolutely amazing! For me, it was like a dream come true," Morse told Beijing Review . "I know our countries are competitors in the world, but I feel that President Xi really has warm feelings for the American people. His visit to our school helped make a closer connection between our two countries." "I know the fortunate students who go will learn so much about your amazing country--its long and rich past and its energetic, vibrant present and exciting future. I think all 100 students will become international ambassadors of peace and friendship between our two countries," he added. Morse has taught at the Lincoln High School since 2002. His first trip to China was in 2004 with a group of teachers from the northwestern United States sponsored by the National Consortium for Teaching About Asia, an organization funded by the Freeman Foundation. "China was amazingly industrious and beautiful at the same time with so many wonderful, friendly people. It really inspired me to teach my students about China and its central role in world history and current affairs," Morse said. So far, Morse has been to China for nine times and has traveled extensively throughout eastern and southwestern China. His 10th trip will take place during his winter break later this year, taking him to Fuzhou to teach English at Hwa Nan Women's College. Chinese and Americans, in Morse' eyes, have many similarities--they are friendly, outgoing, hard-working, patriotic and family-oriented, and they have a good sense of humor. "My hope is that every student in the United States has the opportunity to study Chinese if they so choose. It seems like everyone in China is trying to learn English, but here very few American students have the opportunity to learn Chinese," Morse said. "Chinese, like English, will become a lingua franca for the world in the 21st century. By learning Chinese, American will be able to work with the Chinese people to ensure a safe and prosperous future for the world," he said. "I think language is the key to truly understanding the heart of another culture, which is why I hope we can have Chinese language instruction in our schools," he added.